RABS mitigate the risk of contamination to sterile materials, containers, vials or surfaces that may come into contact with the product. This significantly enhances aseptic conditions as compared to conventional cleanroom operations. Germfree’s RABS are custom manufactured for each biopharmaceutical application. They range in size, process-flow, and requirements for air filtration. While each model may vary, it is critical that the units are built to appropriate guidelines and standards. We also specialize in the integration of components with complex designs. Germfree offers both Closed and Open RABS. A key consideration is the proper engineering of air handling and filtration systems. RABS are ideally suited for handling sterile, non-hazardous products. However, with enhanced containment and SOPS some applications that include materials with limited levels of toxicity can be processed in a properly designed Closed RABS. Our Closed – Active RABS incorporate onboard unidirectional HEPA filtration that provides ISO 5 air to the critical zone. These units operate within a cleanroom environment with a minimum standard of ISO 7. An integrated entry system or MAL (Material Airlock) allows for aseptic transfer. Interlocking doors are utilized if a rare open-door intervention is required. 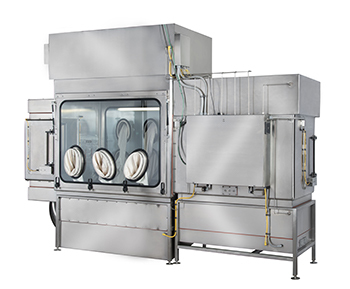 Biopharmaceutical applications that involve handling highly potent products, toxic APIs or dangerous pathogens are conducted in Pharmaceutical Containment Isolators. Germfree offers multiple-chamber RABS that can also be combined with isolator lines. This allows you to separate your materials, processes and improve workflow. Filtration systems and airflow controls are configured to prevent cross contamination or provide containment between chambers. This facilitates the handling and transfer of materials between barrier systems and allows sterile products to remain under isolation. Pharmaceutical applications range significantly in their scope and requirements. Germfree has extensive experience in manufacturing custom barrier systems that meet the most stringent fabrication standards. We have a proven track record of delivering advanced products. Our leading-edge fabrication technology, engineering team and subject-matter experts are all located on-site, in our US factory. We provide an efficient and collaborative design process and coordinate all logistics. From concept to completion, we deliver advanced solutions in an accelerated timeline. Contact Germfree to discuss your specific application and requirements for Pharmaceutical RABS. Germfree also manufactures Pharmaceutical Isolators and Class III Biosafety Cabinets for containing a wide range of potentially hazardous materials. 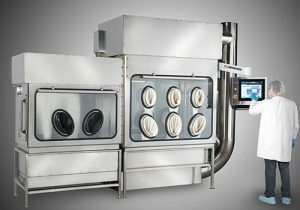 We also offer Unidirectional – Laminar Flow Glovebox Isolators (LFGI) and Compounding Aseptic Containment Isolators (CACI).